I'm going to a 4th of July party at which I'll be in charge of grilling the hamburgers. A LOT of them. The ground beef available around here is so lean and not-so-great for hamburgers. I suggested to the host that she have them mix in some ground pork, maybe 25% of the total, added to the beef in the hope that it might fatten them up a bit. Any other ideas or ways of doctoring up the mix in the hope of producing some juicy burgers? We're talking about 5 kilos of burger meat. I get to make the patties! Pork here is too lean to help give you the extra fattiness you want in your burger. Go to the butcher at the corner of Marcos Castellanos and...well, where the fountain is, about a block south of the carretera. Ask him for some grasa de res molida--beef suet. Or just buy some manteca de cerdo from him--lard--and add that. It will give your burgers a spectacular flavor. Where are you buying your carne de res molida (hamburger)? Wal-Mart's molida de sirloin is about the best there is, and not expensive. You're on your own as far as proportions are concerned! I think it will be trial and error. I don't like this answer! I don't at all mind eating dishes prepared with lard, but I'm sure not going to work with. I don't care if it is the 4th of July or not. It's not my party and I'm not that patriotic. I don't know where the host is buying the meat. She's going to deliver it to me and I'm going to prepare the patties. I made a couple of test burgers last night with ground beef from WalMart. They were as dry as sandpaper. I wonder what ground bacon would do. Hmmmm. esperanza's answer is pretty well spot on, except I disagree on using beef suet to up the fat content. Ground beef suet just does not melt well enough in my opinion. Better is to ask for the carne de res molida to include around 15% or even 20% fat (grasa). That would mean (for 5 kilos @ 20%) 4 kilos of the regular very lean beef they use and 1 kilo of beef fat trimmings (NOT suet). Lard might work, but (at least at the carnecería I use) their lard is too refined and too liquid and wouldn't stay in the patties long enough to be very helpful. A friend of mine adds mayonnaise, but when I tried that my patties fell apart during cooking (although the flavor was decent). All in all, getting your hamburger beef custom ground with a decent amount of beef fat trimmings is the only real solution, although I've been thinking about trying a small amount of soya powder mixed with a fairly solid vegetable fat (like Crisco) that I've seen sold in the stores here, but right now I don't remember the brand name. There's absolutely nothing icky about real lard. Maybe you are thinking of the blocks of hydrogenated white disgusting lard that is sold to heaven knows whom in the USA. The lard sold at your butcher shop is absolutely nothing like that. It's freshly rendered from the pig, delicately flavored, and easy to work with. I use it at home all the time. In fact, today I made some hamburgers from Wal-Mart's ground sirloin--first I melted a little lard in the frying pan to brown the first side, then the second. esperanza, you are quite right about the quality of the lard sold in most carnecerías, it's great, and I use it for a lot of things, but what I use is totally liquid at room temperature (just like veg oil), so I actually haven't tried it for hamburgers. I'll do so in the near future and report back on this thread (even though it will be too late to help out tashby). If it works, it will sure make things easier than having my hamburger meat custom ground. Maybe chilling the beef-lard mixture to solidify the lard will help, since it does get solid in the refri. esperanza, you are quite right about the quality of the lard sold in most carnecerías, it's great, and I use it for a lot of things, but what I use is totally liquid at room temperature (just like veg oil), so I actually haven't tried it for hamburgers. Mazbook in Mazatlán, temperatura ?? That may explain the different liquidities of lard. As to hamburgers, our carnicería tries to please, but they steadfastly believe a lean grind of beef is best for hamburgers. I have resorted to having them blend up to 1/3 ground pork in it, which helps. After a while they have learned our preferences, and will add fat on request. But I have to be specific everytime. Thanks for all the suggestions everybody. I'm particularly heartened by Anonimo's confession that at times he's resorted to using a mix of ground beef and ground pork and that it's helped somewhat. Why? Because I took delivery of the meat today and sitting in the fridge is over 5 kilos of meat, almost a third of which is ground pork. The ground pork is from the leg, I think, and hopefully came from an especially fatty volunteer pig. I like the idea of draping the burgers with bacon while they cook, but hestitate to add any more pork at this point. Any experimenting with lard will have to be confined to home when I'm not responsible for burgers for fifty people. Tomorrow I'll mix up the mess with some seasonings, worsteshire sauce, maybe a bit of water and form the patties. Wish me luck. So what did you do to the ground beef to add some fat? And how was it? I saw a video of you snarfing down a burger...looks like it was a great party! I was intending to pursue this further, so thanks for the provocation! So as I said, I used a mixture of ground beef and about 1/3 ground pork. The night before I mixed it up with some seasonings and formed 48 hamburger patties. (There's something I'll never do again...) Anyway, I think the pork content helped, but they certainly weren't anything great. Still, as far as I know nobody has contracted trichinosis, so we're going to call it a minor success. I just received a message from someone who managed to get a butcher to custom grind some beef, including cuts of beef that significantly increased the fat content. "Best burgers in Mexico ever...." It's easy enough to get a butcher to grind meat, but which cuts should he use? The last time I attempted something like this with a butcher, I just got a blank stare. I think the key is knowing the Mexican cut of beef that's similar, say, to a chuck roast in the U.S.
P.S. I hope you're kidding about the video. 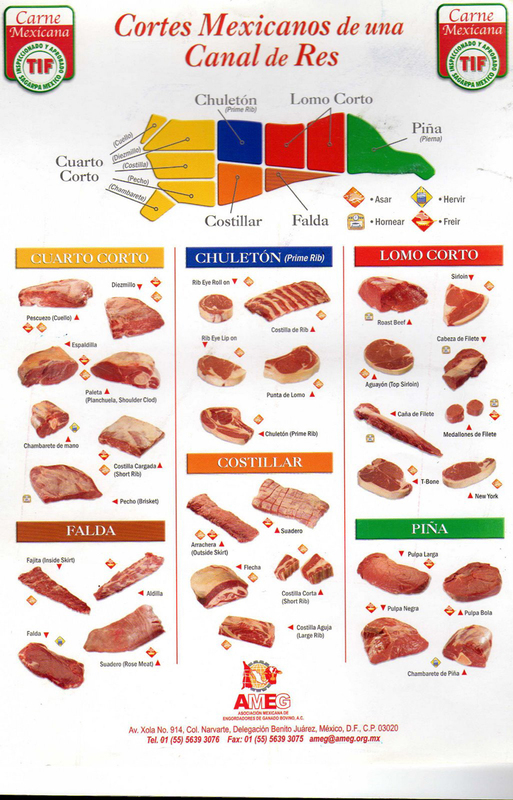 Here is a small start on identifying Mexican beef cuts. I'm not kidding about the video. It's on Facebook. Blame Elliott. ETA: Cross post with Rolly. Great picture. Makes me hungry. I've copied it to my website. Yesterday we lucked out, and our butcher got it perfectly right. This PDF happens to be hosted on the Spanish-language site of the California Beef Council (CBC), but the chart was originally created by the (US) National Cattlemen's Beef Association (NCBA). However, at the risk of being labeled an apostate from the Church of Beef, I will assert that the best hamburgers you'll ever taste are made from ground lamb. Fantastic! Look at all those beautiful beef charts. I was about to overlay a USDA chart against the one in Esperanza's post, but then saw Kimpatu Hekigan's great big pdf file. Now that's a keeper for sure. Thanks! Now, trying to make any of this magic happen at the local butcher is another issue. What I've found to be most helpful is to ask my butcher for whatever it is I need a week in advance. He can get anything, given a week's notice. He has even brought me pecho (brisket), which people swear is not available in Mexico. Most of these cuts are not available at your local supermarket, not even at Wal-Mart or one of the other big stores. They don't get sides of beef to cut to your order; they receive cryopak-ed hunks that include the beginnings of one or two cuts. But a real butcher--like the guy at the end of Guadalupe Victoria in Ajijic--can get you anything. Diezmillo, sliced very thin, makes great carne asada, by the way. I use chambarete for caldo de res--about a kilo for the stock, simmer it for about two hours with a couple of minced tomatoes, a fistful of fresh cilantro, a couple of carrots, a whole white onion, some parsley, a garlic clove, a chile serrano, and a stalk or two of celery. Then remove the meat from the bone and add the meat back to the pot before serving. Discard the cooked-out veggies when the stock is done and add fresh ones for serving: carrots, zucchini, potatoes, green beans, chayote, cabbage, some 2" pieces of corn on the cob, and some cooked garbanzos if you want. Serve with lime to squeeze into it, fresh cilantro, and the table salsa of your choice. A great chart! However, it fails to explain why we cannot find a proper cut of beef here in NM for Arrachera. We have tried every source and alternate cut of beef without success. What I've found to be most helpful is to ask my butcher for whatever it is I need a week in advance. Oh dear. I'm a bit allergic to planning ahead. Nonetheless, thanks for the tips on Carneceria la Fuente. I've only been in there once, but figured he must be a good butcher since there's always five or six dogs lazing happily just outside the front door. I'm hesitant to even ask, and I will anyway.....when I move to Bucerias, just north of Puerto Vallarta, will I be able to find ground turkey? Maybe at Costco? I use ground turkey in place of ground beef for most of my meat dishes and burgers now. Like the texture better and its flexibility, not to mention the low fat content. I have almost always found ground turkey at the Mega markets in Morelia, but I've never seen it anywhere else here. And there's a shiny new MEGA right down the street from Bucerias. Just inches away, really. Not that I'm bitter. If it's available in Costco, there's a 90% probability it's available at Costco in PV. Also Soriana near the marina has lovely ground beef in several percentage ratios, including 95% meat 5% fat, and on up. Absolutely fabulous Jalisco lamb available in the Chapala area, a third the price of the Costco New Zealand. Tony's next to Superlake can get anything including a whole lamb, with a week's notice. Agree that lamb trumps cow, hands down! Surely you are not serious , Chinagringo. Flank steak, the primary cut for arrechera, is widely available in the United States and so is skirt steak which, by the way, is a much superior cut to flank steak in terms of tenderness and flavor. By far the best "arrachera" I ever tasted was purchased at a chain restaurant in San Francisco along with divine quail - a specialty of Sonora. No wonder Mexicans migrate to the "Lourdes" of Mexican food which starts in East L.A. and heads north to The Mission District in San Francisco. It makes sense to me that the most ambitious and innovative Mexican food chefs in North American head for California and even (shudder) Texas. Even the precious food of Santa Fe (New Mexico) is more interesting than 90% of the Mexican food you´ll buy in Mexico. That´s just the way it is. Stay here for the sun and not the food. The best Mexican food, by far, that I ever tasted, was in the "roach coaches" and eateries of East L.A. where my wife worked for years. I used to look forward to lunches with her and her reprobate co-workers to the point that I would fly down from San Francisco just for the experience and, believe me, that was a touchy town. I cannot think of one meal I have enjoyed in Mexico that equals the food I have fawned over in East L.A. or the Mission District of San Francisco . Go figure.